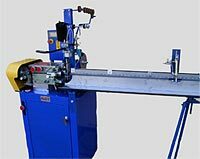 Whether you produce elements for aquarium heaters, diesel engines, heat-treating ovens, kilns, small appliances, space heaters, hot water tanks, stoves, or any other use, there’s a Platt Coiler that will meet your demanding requirements. 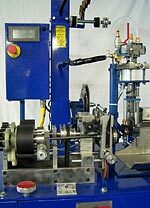 Platt Coilers are easy to learn, quick to set up, and so simple to operate that they practically run by themselves. The World Model 3000, Mini-Matic 4000 and the Brute have many identical components mounted in the same relative locations to make the operator’s transition from one model to the other quick and simple. Every Platt Coiler embodies the best in workmanship, pneumatics, electronics and electrical components at an affordable price. Your coiler, with proper care, will have a life expectancy of many, many years. 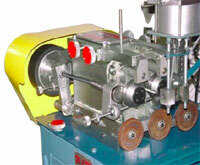 In fact, there are Platt Coilers still operating at peak production that have been in the field for several decades. Read below to learn more about Platt Coilers and what they can do for you. Coil the finest of wire with the Platt Mini-Matic 4000 – and it does not require a fine sense of touch by the operator. We have built this into the Mini-Matic for you! The World Model 3000 is the result of our more than sixty years coiling expertise. With the Platt World Model 3000 you will be able to coil the widest range of wire gauges, coil outer diameters, and coil types than on any other coiler on the market today. The BRUTE has a coiling range from 8 gauge to 22 gauge wire with coil ODs ranging from .080 and up. Coils of 1.00″ OD have been coiled. Platt Coilers have gone through many changes over the years. The latest is the Programmable Logistics Controller ( P.L.C.) which is used to access all functions of the Platt Coilers. Coil length, batch counter and motor speed are just a few all settings can be adjusted while the machine is running. If the machine shuts down, there is a faults phase that will show you where the problem is, shortening down time. The P.L.C. comes with all new machines and can be added to any EG, EGA, E1, WM3000, MM4000, or the Brute Coiler. Copyright ©2016 S.A. Platt, Inc.